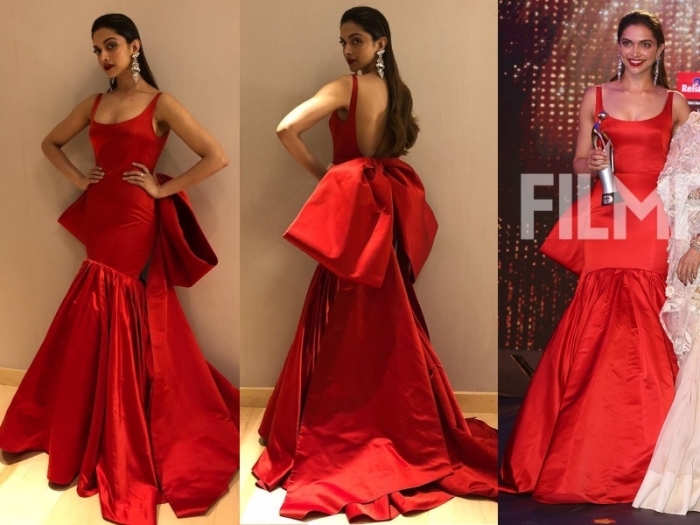 Anya wore gowns to both the Awards ceremony this past weekend sprting a Namrata Joshipura to the Filmfare Glamour and Style awards first and then a blue Manika Nanda to the Star Screen Awards. The black shimmery gown needed a more interesting do and that’s probably why we preferred the blue look a whole lot more. You? At first glance, I did love the look, but the more I look at it, I feel like the gown should’ve been more of column design for an even more impactful look. What say you? Surveen kept it simple and sparkly at the Filmfare Glamour Awards wearing a shimmery number by Sameer Madan with Aldo block sandals. With other guests going for very formal voluminous gowns, her dress might have felt too simple but she sure looked good in it. The only one to do a sari at the Filmfare Glamour and Style Awards was Rekha in her white floral embroidered one. I didn’t care for the sari nor the gold blouse but she still looked so graceful that it worked. Kriti attended the Glamour and Style Awards on Friday evening wearing a red gown by Dubai based label, Arushi Couture. While I may not have felt excited about the gown itself, Ms. Kharbanda sure looked good in it.